Does that sound good or what? 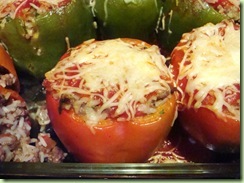 I think I’m going to make some eggplant parmesan later this week with the eggplant. 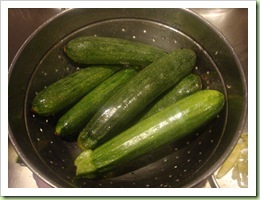 And I’m going to dip back into my Middle Eastern repertoire and stuff the big bunch of zucchini I picked up last week. I’m really looking forward to that challenge! 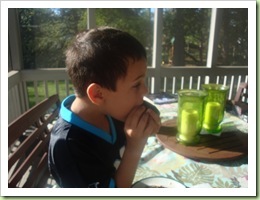 Last week I made stuffed peppers and a gi-normous BLT sandwich! 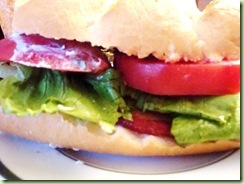 I used some of the fresh basil from my garden to make a basil-mayo and spread that all over the sandwich. It was messy indeed! 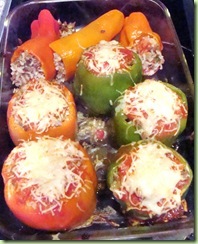 I used a recipe from Cooks Illustrated for the stuffed peppers. 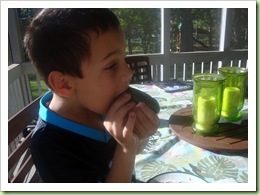 So, I had an eggplant from last week, and another from this week… it was time to use those babies up! 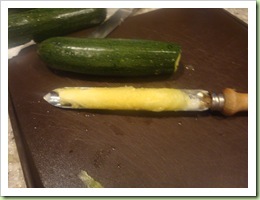 I’ve already turned previous eggplants into their ‘parmesan’ counterparts, so I was ready to try something different. Then inspiration struck! It was time to go old school! 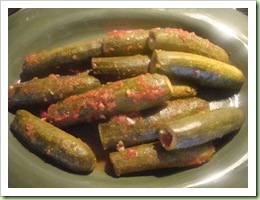 Being of Middle Eastern decent, I grew up eating some of the most delicious food imaginable. 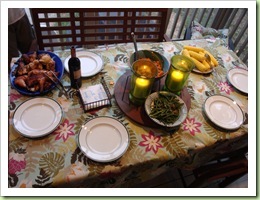 I don’t often try and replicate the dishes mom makes, because, well… you just never can! They never taste quite the same as when mom makes them. But I was craving a piece of home, so I decided to turn my eggplants into one of my favorite childhood dishes… Metlube (pronounced metlubeh). It tastes better than it sounds! 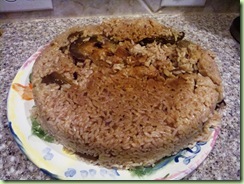 You can think of it as an eggplant and rice casserole! Basically, you get some stew meat (I like to buy the whole chuck roast and cut it up myself) and brown it with salt, pepper, garlic powder and allspice (be generous with the spices!). Once the meat is nicely browned, add enough very hot water to cover, and bring to a boil. Let the meat simmer until it’s tender, about 30 minutes or so. About two minutes or so before it’s done, add about a teaspoon of ground cardamom. When it’s done, drain and reserve the liquid. Meanwhile, peel and slice the eggplant (1 large or 2 small) and brush with olive oil and broil on both sides until slightly soft and nicely browned. Now it’s time to bring it all together! 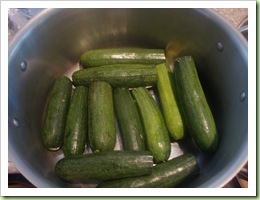 Find a nice pot (about 6 quarts) that will allow you to lay a plate flat against the top… this will be important later! Scatter about 1/2 cup rice on the bottom of the pan. 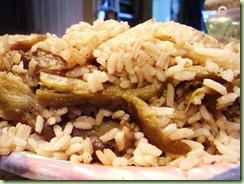 Then arrange the eggplant on top of the rice. Layer the cooked meat on top of that. Scatter another 1 1/2 cups of rice on top of the meat. 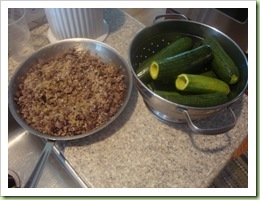 Add enough water to the reserved cooking liquid to measure a generous 4 cups and pour over the eggplant/meat/rice. 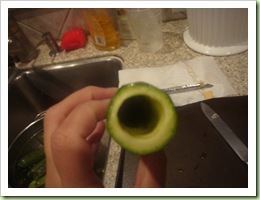 Bring to a boil, cover, and then reduce to medium heat for about 15 minutes. 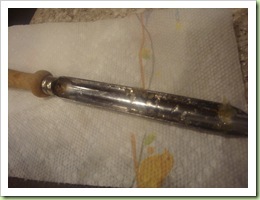 Turn the stove to low and simmer until all the water is absorbed… you’ll have to listen to it! Let sit for about 15 minutes or so to settle. Then take the large plate I mentioned earlier and set atop the pot and flip over! 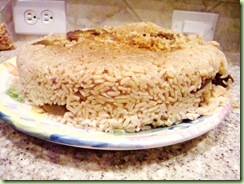 You should have a cake-like concoction with rice cooked around layers of eggplant and beef! Voila! Serve the Metlube with tomato/cucumber salad and plain yogurt for an authentic Middle Eastern Meal! Fantastic box of produce this week! I have some big plans for the goodies this week! 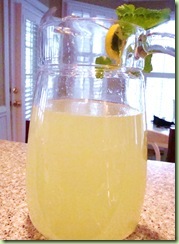 There was a recipe included for Lemon Balm Lemonade that I promptly whipped up because it sounded so refreshing!! And we were not disappointed! September is the month of Birthday in this family… 6 in all! Last night we celebrated all the Mall Birthdays with a feast! Almost everything we ate was a product of local farmers! I butterflied (removed the backbone) two whole chickens and brined one in beer and the other just grilled with a Dijon/thyme rub. The birds were pasture raised in Rutherfordton county, and believe me when I say, the birds you get at the Teeter really shouldn’t even qualify as chickens! These are truly delicious! I used the sweet potatoes and red pepper from my produce box to make a chili-lime sweet potato salad. And the corn… well, we decided to just enjoy it in all of it’s corn glory. 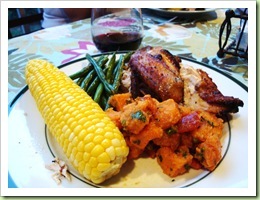 A little note on the corn… this is one of the few times you DON’T want to add salt to the water. Add SUGAR instead and you will bring out the natural sweetness of the corn. Salt your corn right before serving! I also made green beans with carmelized shallots. The beans were the only thing I made that wasn’t sourced locally. And finally… the piece de resistance. 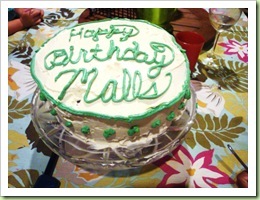 The birthday cake. Chocolate cake with REAL butter cream frosting. Between the cake and the frosting – I used 8 eggs (and I won’t tell you how much butter). All the eggs came from pasture raised chickens in Rutherfordton county!